… but I’m sure they were there. As with the jail where Paris Hilton wasn’t, there are, of course, many places where we haven’t seen wild coyotes, and two where we have: Death Valley, and Sauvie Island, outside of Portland. 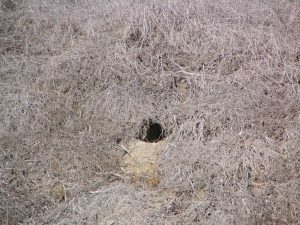 But this is the only place where we haven’t seen wild coyotes but did see their dens. I counted about a dozen of them. 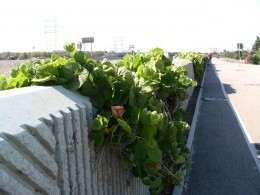 Lee talked to a bicyclist who pointed them out and said he’d seen them, otherwise I’d have thought they were just holes in the freeway embankment, or more likely, I wouldn’t have seen them at all. 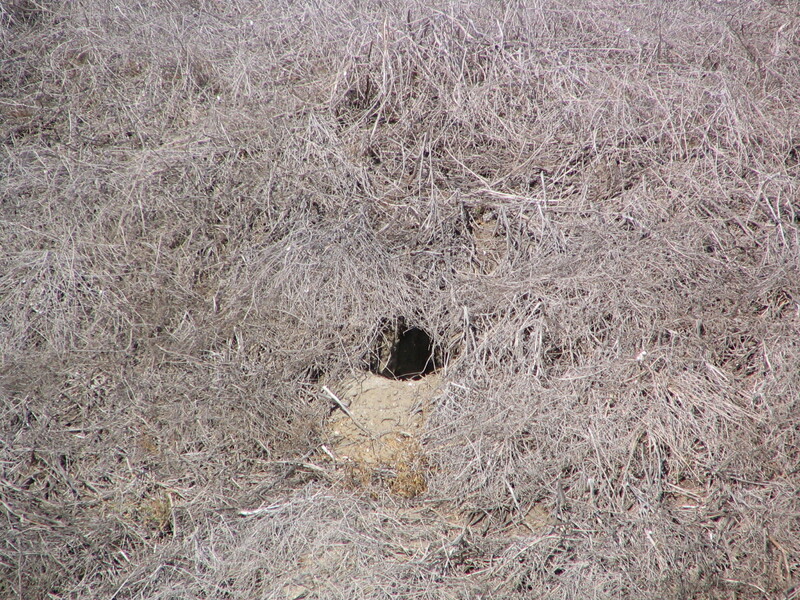 But on closer examination you could see the dirt that had been excavated to make these holes, and it was clear an animal had done it, and that the animal was about the size of a coyote. Might have been wild dogs, but I doubt it. Coyotes are so damn smart, but who would have thought they would hunt and rear their young only about 50 yards from the insane traffic on the I-710, the Long Beach Freeway? From the above, all that about something that didn’t happen, you might conclude that there wasn’t really all that much to write about on this day of walking, all of it in the rather drab little community of South Gate, and you’d be right. 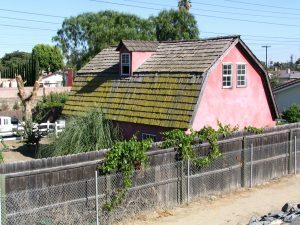 It has an interesting recent history, but it mostly involves Albert Robles and his gang of thieves and thugs, who ruled the city and almost bankrupted it with their brazen graft, before trying to take over nearby Vernon, as I chronicled in an earlier report. The little town is now $150 million in debt. It is the hometown of Glenn Seaborg, the Nobel winning chemist and co-discoverer of 10 new elements, and Niki Sullivan, guitar player in Buddy Holly’s original Crickets. It was the titular site of the 16th World Science Fiction Convention, Solacon, in 1958, though the actual con was held in Los Angeles. 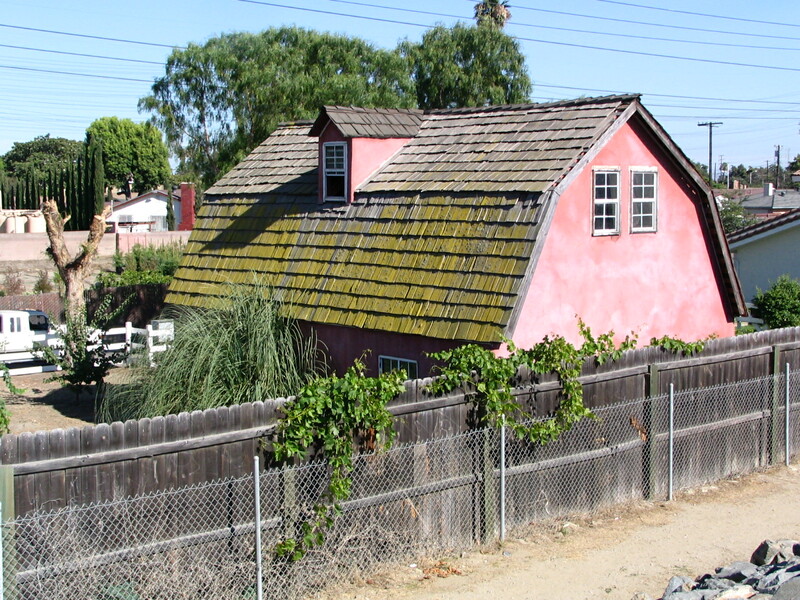 Apparently the town was picked to front the bid solely so they could use the catchy phrase “South Gate in ’58.” Weird. A big 211 people attended. The next time Worldcon came to the Southland, in Anaheim in ’72, 2000 people came. The time after that, L.A. Con II in ’84, there were 8,365, still a record. I was one of them. Most people agree the massive attendance was because it was the first time, anywhere, that all three Star Wars movies were being shown back to back. I didn’t attend that. And there you have a brief history of South Gate. Once again we were able to walk on bike paths along the river all the way from Firestone to the Imperial Highway, and it looks as if on our next walk we’ll be able to continue that way. 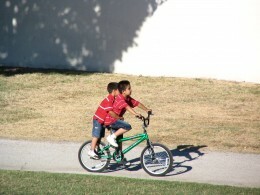 In fact, it appears that there are bike paths on both sides of the river here, which is the first time we’ve seen that. Grapes have been planted along the concrete retaining walls, which will be nice when they fill in more. Well, they’re nice already, of course, but they’ll be nicer. Over a railroad and under a freeway, and there were the coyote dens. On the other side of the river a new stream joined the river: The Rio Hondo, which means Deep River in Spanish. It was about as deep as the LA River, and almost entirely dry. What little water there was looked like something might have sprung a leak. 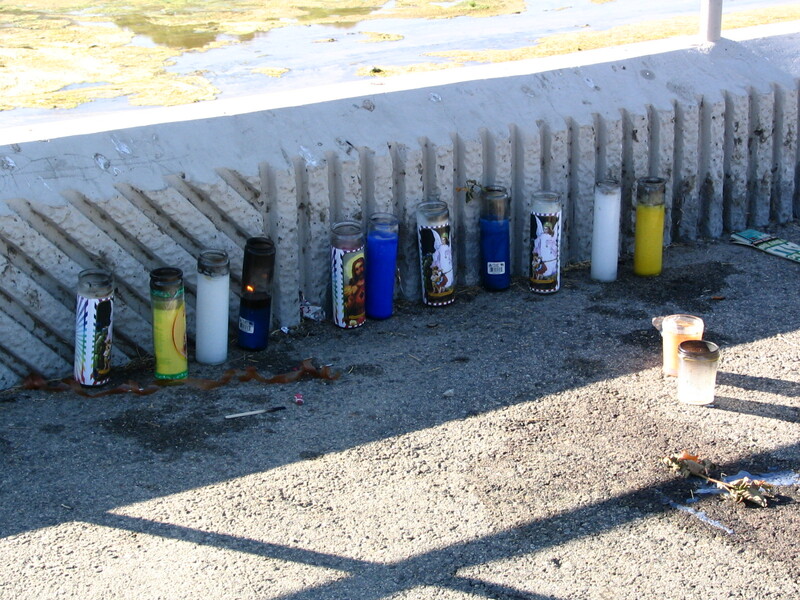 There were a lot of trucks driving on the Rio Hondo. They were digging something up and hauling away a lot of dirt. Maybe they were fixing the leak. Just across the river … horses! We hadn’t seen horses since our surprising visit to horse country in Burbank. We came within spitting distance of the town of Downey, which is bordered by the Los Amigos Country Club. Lee discourages spitting in her presence, so I didn’t, and I wasn’t really tempted to detour the half-block it would have taken us to enter the town, one of the largest in the Gateway Cities. Even though it contains such wonders as the fourth McDonald’s (pre-Ray Kroc!) and the first Taco Bell. Our apartment is about two miles from the river at its closest point. That point happens to be just about halfway down its length, so we’re now experiencing the same thing we did when we were walking up the river: It’s getting to be a long ride from home before we can begin our walks, and a long ride back. The best time to travel is obviously between rush hours, but that’s also the hottest part of the day. Freeways are likely to be jammed, and surface streets, though not as frustrating, are no faster. What to do? Well, this time we’re helped by the Metrorail system. We’re occasional riders of the Red Line, the subway from Union Station to North Hollywood, but there’s another train, the Blue Line, that goes from downtown to Long Beach. It so happens that at this point in our walks the river and the Blue Line are getting closer together, to the point that it makes sense to ride the train down there and then take a bus along the cross streets until we reach the river, then walk down the river until we can take another bus back to the next station down the line. Today we tried this, and it took just about an hour from apartment to river. In a car, I estimate it would have taken an hour and a half. To do this you need to purchase a day pass, which used to sell for $3, but a few days ago it went up to $5. Just our luck. However, Metro has a handy calculator that estimates, based on AAA average figures for local gas prices and average mpg for American cars, how much a similar trip would cost you in gasoline, and it informed me the cost would have been $14.68. (Quite a bit less if you’re driving a Prius, and one hell of a lot more if you’re hogging the road and melting the ice caps in a Hummer, I presume.) Since our car is about as average as they come, I’m assuming we saved about 4½ bucks. You transfer from the Red to the Blue at 7th Street/Metro Center, and we did it without a hitch, boarding the second train minutes before it was ready to pull out. 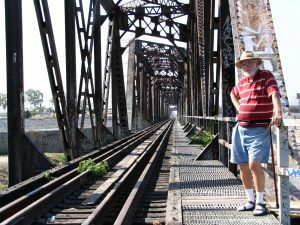 We emerged from the underground station and wended our way through city streets, not all that rapidly, for a few miles, then got onto an old railroad right-of-way (ironically enough, the old Pacific Electric Red Line tracks) and really started to make good time. These trains are three flexible cars long, a bit longer than the Max trains in Portland, which they call “light rail,” which I’ve always assumed was the new way of saying “trolley cars.” They’re bigger than old trolleys, but they do have to stop for streetlights in some parts of their route. 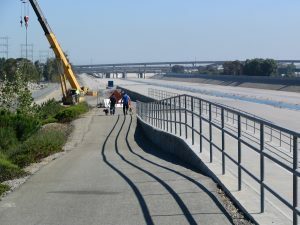 We’d only ridden the Blue Line once before, when we took it all the way to Long Beach just to see what the trip was like. We got off at the Rosa Parks Imperial/Wilmington Station, which is also where the Green Line crosses the Blue. The Green Line runs down the center of the I-105 from Norwalk to Manhattan Beach, which doesn’t happen to be a trip all that many people need to make, so it’s known locally as the Train to Nowhere. Seems it was part of a deal to get the 105 built in the first place. You know: “We’re adding rapid transit here! So what if nobody’s going to use it?” They wanted to take it all the way to LAX, but operators of parking lots out there were aghast at the idea of people parking somewhere else for free and riding to the airport, so the line sort of gives up a little bit short of the runways (there is a shuttle bus from there; whoopee) and then just peters out in a useless downward curve, as if it had no idea where it wanted to go. Manhattan Beach? But it doesn’t even go near the beach part of Manhattan Beach. As for Norwalk … who the hell knows where Norwalk is, or cares? Rosa Parks is a major transit hub, with bus bays under the freeway. We boarded the 121 and were on our way. I’m not a lover of buses, and we’ve seldom traveled on one since coming to LA. In fact, I can only recall one bus trip. There’s something new in buses: Global positioning. This bus had two flat TV screens that showed commercials, and in a box to one side, a map like we’ve become familiar with from Mapquest and Google, that showed the city streets and a little bus icon to show us our position. A computer voice announced the next cross street, and bus stops. As an infrequent rider I quite liked it, though I suppose I’d learn to find it annoying if, heaven forbid, I became a frequent rider. It’s always a little intimidating to board an unfamiliar bus system, not quite sure what the fare might be or if you’ll need a transfer and if it’ll cost anything, not quite sure where you are or where you’re going or when you should get off. This goes a long way to reassuring me, since if I’ve got a map to consult, I’m cool. As for the walk itself, it was just like the previous walk, only more so. 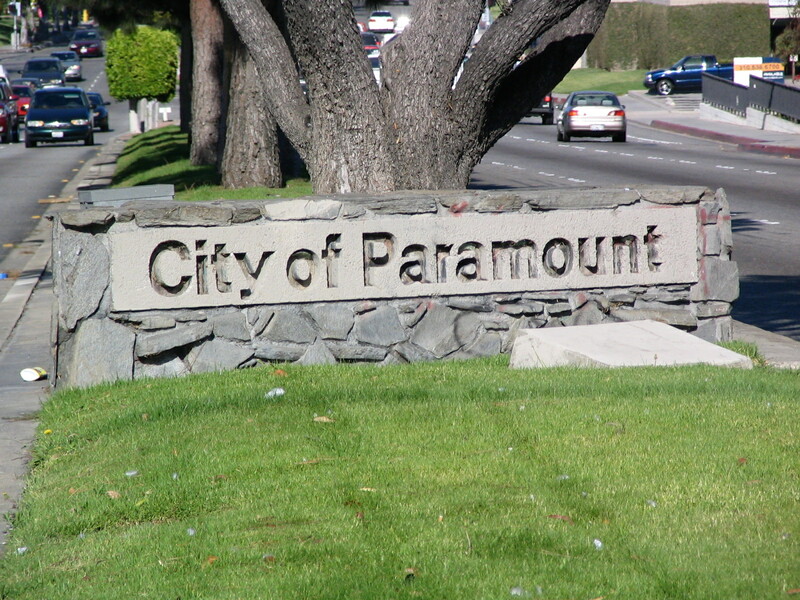 This time we were in the city of Paramount, which has nothing to do with Paramount Studios on Melrose in Hollywood. The best thing about it was that we didn’t have to re-trace our route back to the car, and so could cover more ground without me pooping out. 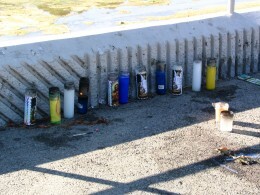 The worst thing about it was waiting about 45 minutes at the corner of Somerset and San Jose for the 127 bus to arrive. I had forgotten how frustrating that can be. We think we had just missed the last of the evening rush hour buses, and the line must have just switched over to once-an-hour service. There were only three things we saw of any real interest. 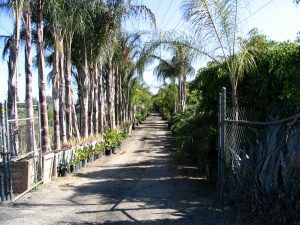 One was a continuation of the Gomez Nursery, surely the longest nursery in the world, if not the largest. We had walked along beside it the previous day. It runs for miles and miles under some high-voltage power lines, not the most desirable real estate in the world, but not an environment a potted palm would worry about. I imagine Gomez, whoever he is, gets a real good deal on the rent from the power company. Then there was the cell phone tower disguised to look like a pine tree. 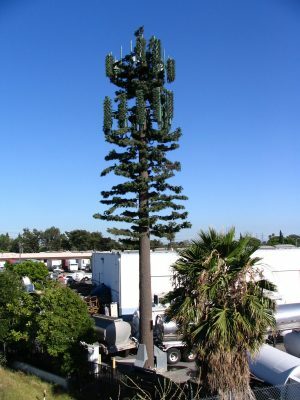 At first I thought the cell transmitters had been overgrown by ivy, but the closer I got the easier it was to see that it was fake foliage, fake branches, even a fake trunk. The giveaway was the big braces and bolts that held it to the concrete like the world’s biggest Christmas tree stand. 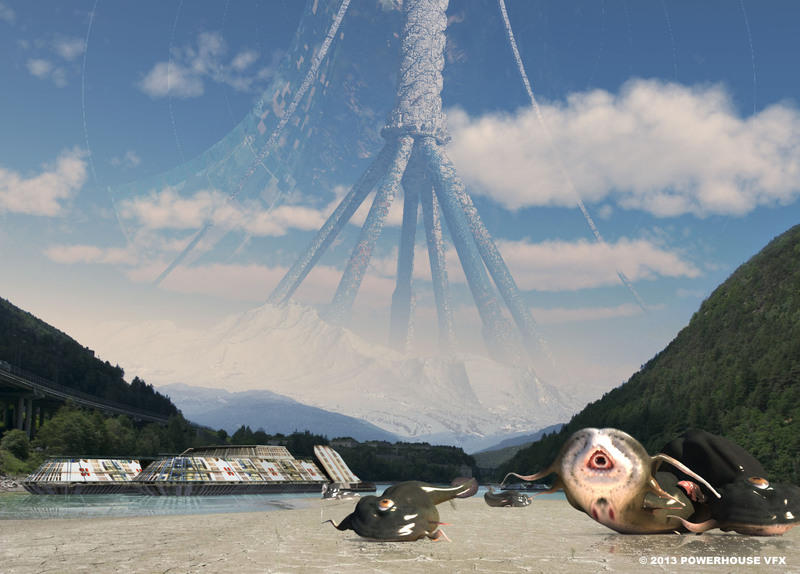 Sort of cool and sort of weird. There are few enough real trees in this part of the metro area. Then there was Banana Park, the second of two parks by the river. I’ve been unable to discover anything at all about it. 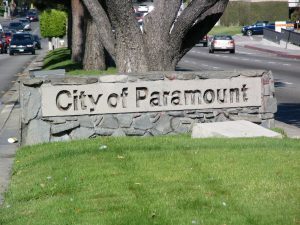 It’s on the Google map and on the Thomas Guide, but the city of Paramount doesn’t acknowledge it on its website. Why Banana? I wanted to know. All I can figure out is that it’s long and narrow. But you can’t play soccer on a banana (or if you did, you’d fall on your keister a lot), and there were plenty of kids there playing. Then it was back to the dread city of Compton – “birthplace of gangsta rap!” – probably the scariest place in the metro area, by reputation and probably in fact. 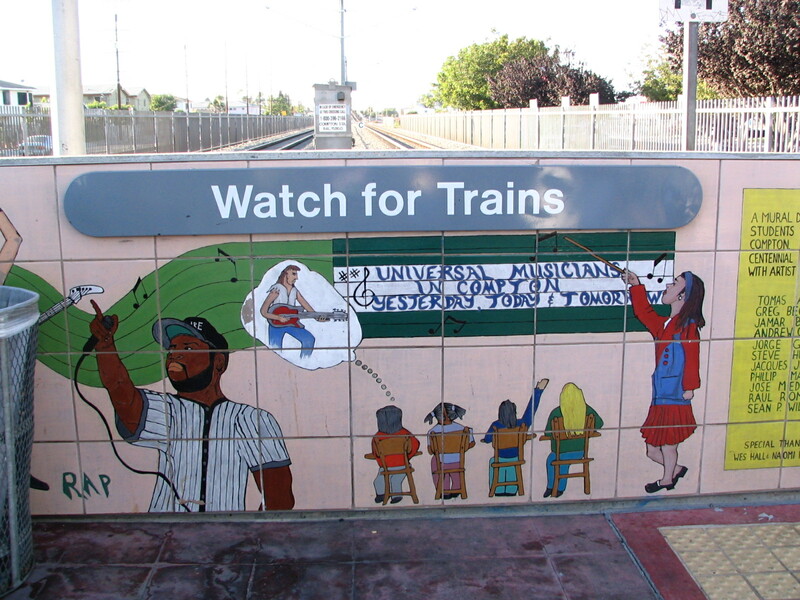 The Compton Blue Line station was nice, as are all the stations, with some pretty ceramic murals. We saw no cause for alarm, either there or on the train. But since Compton is the most dangerous small city in the US, and 4th overall (source: Wiki again, via the Morgan Quitno Corporation), I’ll be glad to see the end of it. We have to return for our next walk, but after that we’ll be in Long Beach. Hurray! The last sign we saw as we exited the bike path along the river was encouraging: PACIFIC OCEAN: 10 MILES.